Some while ago I wrote about RaboDirect and how they are putting it up to conservative Irish banks through their innovative use of the web. 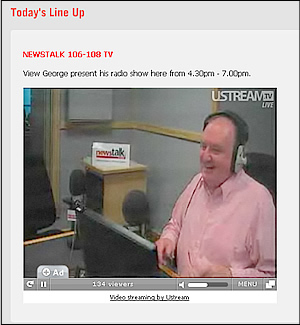 NewsTalk 106FM provides another example of adventurous web content. Since last Friday the Right Hook show has been streamed live on the web. Nothing new there you say. However, they are not just streaming audio - but video as well. That means you can watch George Hook as well as listen to him. Well, let's wait and see. The screen-capture at right shows that only 134 people were watching at that moment. That must be a tiny percentage of the total listenership. But even if this video idea proves to be a flop, at least they had the guts to try it out. They didn't just slavishly try to imitate the BBC. They created interesting web content within the constraints of their own budget. So hats off to Hookie & team.